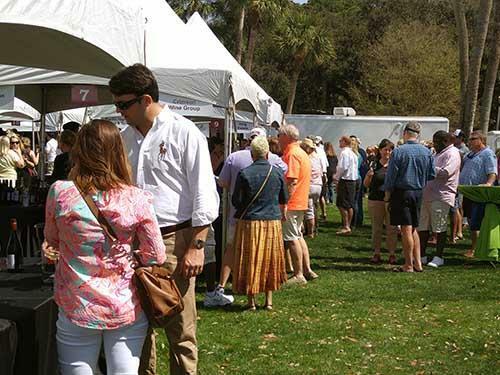 When the weather begins to warm and the azaleas are just about to bloom you know it’s time for the annual Hilton Head Island Wine and Food Festival. I like to consider myself a wine enthusiast. Words like tannins, undertones and finish don’t intimidate me, however, in no way do I profess to be an expert. It’s my point of view that wine does not have to be complicated. A Master Sommelier once told me that a wine is only good if you enjoy it. It’s that simple. So if you are an enthusiast like me, this is Hilton Head’s event of the year. Traditionally the Festival kicks off in late January, early February with the International Judging Best in Show Wines. Judges from the Court of Master Sommeliers, Society of Wine Educators, International Sommelier Guild and Wine and Spirits Education Trust come to the island to choose the Best of Show in the category of White, Red and Dessert and what they deem Silver, Gold and Double Gold wines for the season. These wines are then featured during the Festival Week. Although nice, the judging is way too high brow for me. It’s the week of events in March that satisfies my need for wine focused activities. You can attend the Wine+Cinema Event early in the week where you can enjoy a variety of wines, heavy appetizers and desserts before, after and during the intermission of a featured wine themed movie. Theaters should really pick up on the concept, right? And…later on during the week you can Sip-n-Stroll at the shops in Harbour Town. I know..shopping AND wine. The perfect combination! Throughout the week there are also plenty of opportunities during the day to participate in Knowledge Sessions, and during the evening to attend Wine Dinners at various restaurants featuring a variety of vineyards. But the highlight of the week, and my current favorite thing to do on the island, is the Food and Wine Festival Public Tasting. 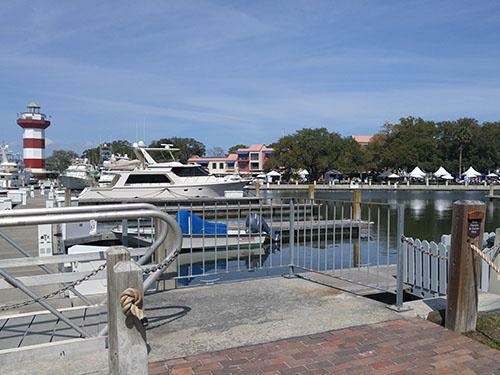 The picture perfect Harbour Town Yacht Basin is host to this glorious day of food and wine. Live jazz is heard throughout the Festival grounds as you visit vendor and food booths, watch the Bartenders Challenge, laugh at the Waiter’s Race or even get cooking tips by chefs from local restaurants. It is, however, the tasting that makes my heart go pitter pat. Imagine, 250+ wines from all over the world just waiting for you and a few hundred of your best friend wine enthusiasts to taste. Heaven, simply heaven. So this year, armed with my complimentary Hilton Head Food and Wine Festival wine glass, I was ready to meet my self-imposed challenge of finding a new favorite wine. To narrow my search, and let’s face it tasting 250+ wines would make it difficult to get home, I was going to focus on my new interest, red blends. I would try to find the perfect blend of slightly dry/slightly sweet and a bit fruity with a hint of spice that could be paired with a variety of dishes. Let me tell you, I had no idea how much more enjoyable this quest would be as opposed to focusing on a single fruit wine. The representatives from each of the wineries, (some of whom were actual family members and vineyard owners), were eager to educate me about the grapes used to create their signature blends. While some acquire grapes from the same region or state, others prided themselves in the fact that their blends were made from fruit from various countries. Each, however, was sure that their blend was just what I was looking for. We will see. Interacting with other wine enthusiasts was also quite enlightening and quite entertaining. I found it interesting that while the wineries were all about the wine, most of the enthusiasts were all about the experience. I heard wonderful stories about where they first had a particular wine, or why a particular wine or winery was special to them. It’s those memories that played a large part in their recommendations. 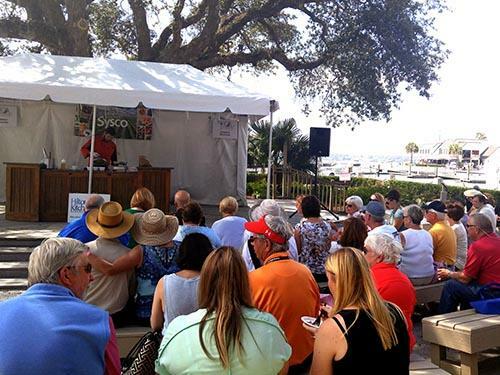 That is the magic of Hilton Head Wine and Food Festival Public Tasting, experts and enthusiasts together, sharing information, sharing stories and sharing wine. If you enjoy wine or just enjoy a pleasant event in a wonderful setting you should definitely make next year’s Wine and Food Festival part of your vacation plans. Oh, did I find my wine? Well among the many wineries represented there was one that I was hesitant to visit. In fact, no disrespect to the winery, I only went to tease my significant other. 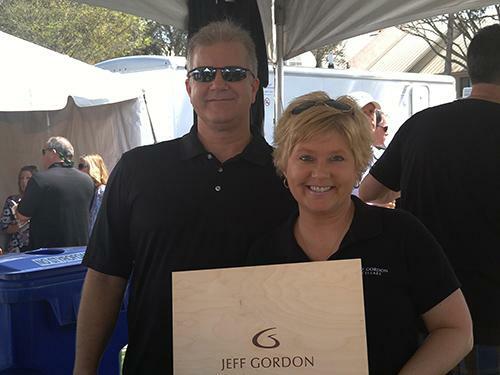 You see, he is a huge NASCAR fan and the Jeff Gordon Cellars were represented at the Festival. Jeff Gordon, right?? Cars yes, wine really?? We met Christy, who was more than enthusiastic about both the wine and her boss, Jeff Gordon. She explained that Jeff has been producing ‘boutique’ wines since 2004. The fruit comes from Napa and Sonoma counties and they limit production of each wine. And wouldn’t you know…they have a red blend. After giggles and teasing and asking if they have sponsors for their wine, I asked to taste their Napa Valley Joie de Vivre Red Blend. It had a nice deep color and a deep fruity aroma. It did not have the dry/sweet combination that I had been looking for all day, but a rather a fruity, chocolate flavor with an undertone of vanilla. It was smooth and well balanced with a fabulous finish and I didn’t want to like it at all. But I was in love. I had found my wine. To me, it is a good wine because I enjoyed it and thanks to the Hilton Head Food and Wine Festival, it also came with a story.